There was no shortage of drama and excitement from Cairns, Australia, during the downhill race at World Champs. Downhill winners were decided at the 2017 UCI Mountain Bike World Championships in Cairns, Australia today. Sunny skies and dusty, dry conditions greeted competitors as they sped through the rainforest-cut course. Sam Hill, first rider down in the Elite Men's field had a blistering run and held it until Mick Hannah. 6th place on his enduro bike. He was one of 4 Aussies in the Top 6. Bruce Klein and Neko Mulally, #USDH stompers had a fantastic runs with impressive finish pedals! Rupert Chapman put down the Kiwi horses for a massive finish to cap off a great top-to-bottom run. Marcelo Gutierrez is a beast. Mick Hannah put it together with a flawless run and powerful finish sprint. Mick has been quite vocal about his training in the region in hopes of winning World Champs and he ran as hard as he could, but it just wasn't his day. He earned 2nd place by .33 seconds. In 2013 at Pietmaritzburg, Mick was 2nd by .39 seconds. Just out of reach for one of the nicest riders on the planet. 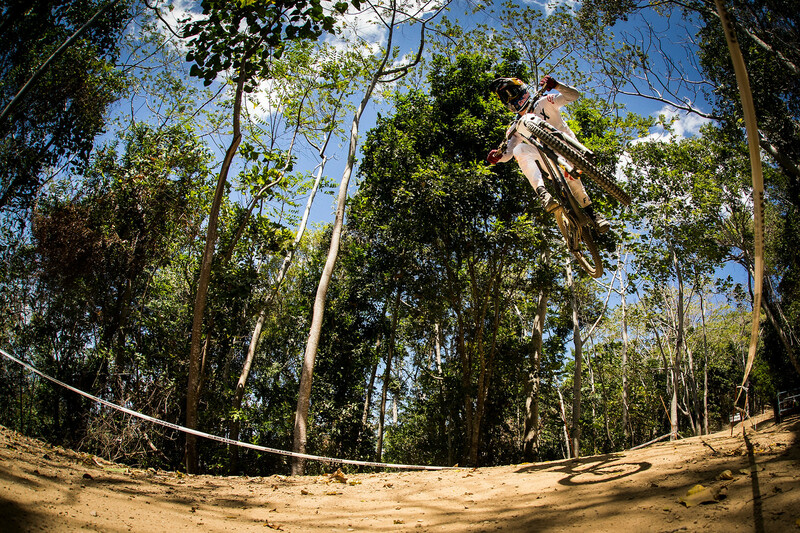 Greg Minnaar and flats are bumming us out lately. How'd Gwin look? We have no idea. Feed tanked. He got a bronze medal though, his first medal from World Champs. Jack Moir, closing out an epic season with 4th place. Loic Bruni - power, perfection and taking the win like only he could. The run was pure grace and focus. YEAH LOIC! (even though you broke our hearts by bumping Mick by less than half the length of a rabid Australian trouser snake). The Elite Women's race results were protested. Apparently Myriam Nicole had a run with no mistakes, but was recorded as 47-seconds off the pace at the first split. 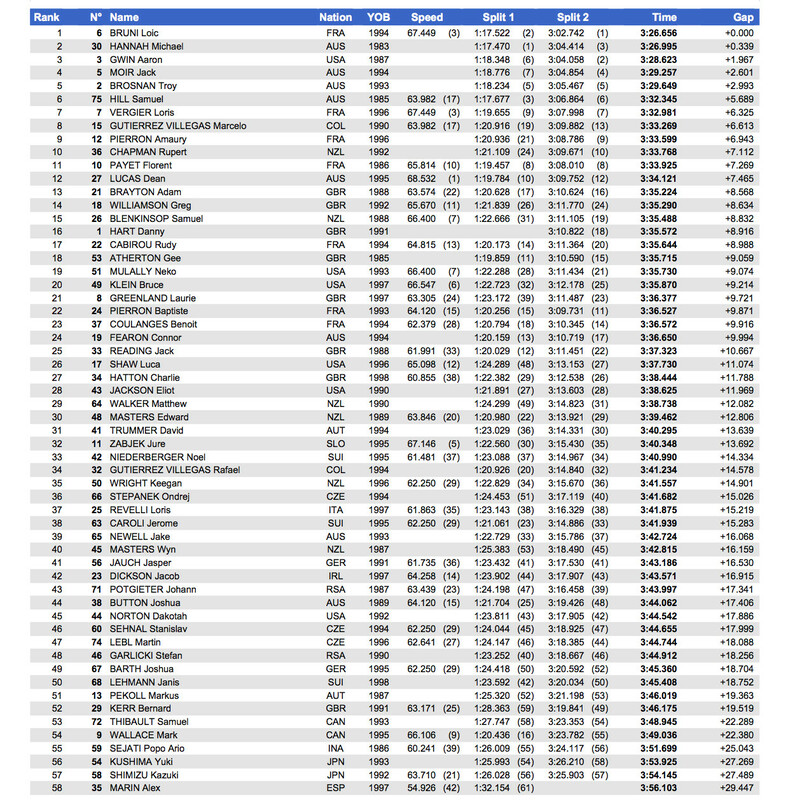 After review, the UCI updated results with Myriam in 2nd place by just. .097 seconds. The Brits take gold and silver in the Junior Men's downhill with Matt Walker earning a convincing victory by 3.44 seconds over fellow countryman, Joe Breeden. Matt Walker becomes the first rider to win a World Champs DH race on 29-inch wheels. German, Max Hartenstern takes home the bronze. Race win favorite and Junior World Cup overall winner, Finn Iles finished in 10th place. Props to #USDH ripper, Nik Nestoroff, on his 8th place result and solid 2017 season. It's great to see such a strong attendance of Junior #USDH women at this year's World Champs. Well done, girls! Keep charging! And a 29er takes its first Worlds gold. Very cool racing. Awesome to continue to see the full senior mens and womens fields. Gutted for the Hannah's, especially Mick, a total of .6 seconds away from 2 rainbow jerseys. A couple more cameras would've been nice. I was really disappointed with the womens race. Was up til 2:30 am and the damn Red Bull feed kept crapping out. Glad it wasn't just me. Really want to see Gwin's run. Quite the shake up in results! Too cool!